It is most often the anniversary of a composer’s birth or death year that spawns a flurry of tribute concerts. So when an ensemble decides to celebrate an artist’s achievement “just because,” it is a refreshing change. 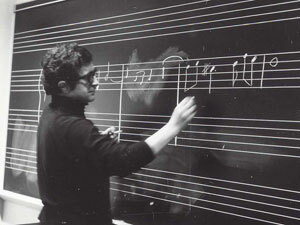 Luciano Berio, who was on the Juilliard faculty from 1965 to 1971, teaching at the School, c. 1969. On October 13, Axiom, Juilliard’s newest performing ensemble, will do just that, presenting “A Tribute to Luciano Berio,” the first of three concerts by the group this season. Jeffrey Milarsky, a Juilliard alumnus, faculty member, and Axiom’s music director, will conduct the ensemble, which largely focuses on the “classic” contemporary works of the 20th and 21st centuries. Berio’s Sequenzas comprise a notoriously difficult cycle of 14 pieces, which he composed for various solo instruments, ranging from piano and clarinet to accordion and guitar. His work on the Sequenzas spanned a majority of his career, from 1958 to 2002. The Axiom concert will feature his first and last Sequenzas, I for flute and XIV for cello, as well as VII for oboe (1969). These pieces focus on creatively exploring the fullest range possible on the instruments, by synthesizing extended techniques with dramatic and virtuosic elements. They often take a very simple idea and develop it to a phenomenal degree. Performing a Sequenza demands a combination of technique, flexibility, innovation, drama, and musical imagery. Perhaps the most famous piece on the concert, Circles for solo female voice, harp, and two percussionists, was one of the first to bring Berio to the fore. The work is based on poems of E.E. Cummings and was important for Berio because of the way he deals with text. According to Milarsky, “The work of E.E. Cummings in its own right is an experimentation of language. I think there is no better poet than him for Berio.” The composer also uses the voice in unusual ways; as an experimental instrument, the voice imitates the sounds of the percussion and harp, while also later having very traditional elements.